Beach Buddy Fashion Tote Bag [Beach Buddy Tote bag] - $19.95 : NewDaVincis.com!, Great Innovative Products, Gadgets and more. 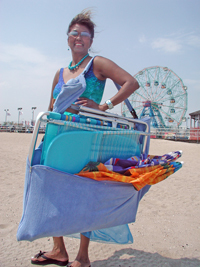 Introducing The World's Most Advanced Fashion Tote Bag That Makes Carrying Your Beach Chair & Beach Umbrella Easy & Effortlessly. This trendy beach bag is stylish and will turn heads! Description: This trendy beach bag is stylish and will turn heads! The Beach Buddy Tote Bag is made of 100% premium quality terry velour cotton. 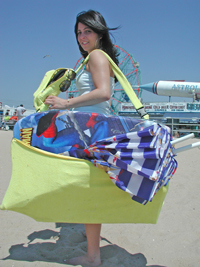 This beach bag is actually 5 bags-in-1, and converts into a full size beach towel and blanket. This one-of-a-kind beach bag consists of 2 small bags (16" wide x 16" long), a large bag (16" wide x 60" long), a waterproof waist bag/fanny pack, a full size beach towel and a beach blanket. Available colors: Sea Blue, Hot Pink and Sunshine Yellow. Please make sure to specify your choice of?color (in the notes section) when ordering. Please note:We are running low on the blue version. Please indicate 2nd choice. Well, if you bought each item that's contained in the Beach Buddy? Tote Bag separately such as the 2 small beach bags, 1 large tote bag, 1 duffel bag, 1 barrel bag, 1 water-resistant waist bag/fanny pack, 1 beach towel, & 1 beach blanket, you would spend much more than $100 !!! The Beach Buddy Fashion Tote Bag...is your solution ! NOW! You Can Carry Everything In One Bag Quickly, Easily, & Safely! Beach Buddy Fashion Tote Bag Expands Lengthways To Fit & Carry Your Larger Necessities Hassle Free & Hands? Free... The Perfect Tote Bag For Beach Umbrellas!" Well, The Beach Buddy? Can Help You Will This Little Problem! Full Size Absorbent Beach Towel On Those Beach Days When You've? Forgotten One!" Terry-Velour Fabric That's Cool, Soft, & Comfortable!" You've Forgotten Your Towel So You Resort To Using Your Tee Shirt To Cover Your Hot Beach Chair! That's Uncomfortable So You Sit On The Sand, But It's Hot, Too! What Do You Do You're In Luck Because The Beach Buddy? Fashion Tote Bag Is Also A Cool, Cushiony Soft Beach Blanket That's Perfect For Those Hot Days When You're In Need Of A Comfortable One, Too!" The Beach Buddy Fashion Tote Bag Is The Only Bag You'll Ever Need For The Beach, Pool, Spa, Caribbean Vacations, Cruises, & Caribbean Excursions!" Tote Bag Is Sure To Make Your Life A Little Easier & A Lot More Fashionable! Protect Your Beach Day Essentials In The Beach Buddy? See how easy it is to zip close the Beach Buddy? tote bag. You have the option of placing your items in the tote bag while it is open on the sand then zippering it close. This is a fast and easy way to pack up all your items at once. Umbrella, If You Want To Avoid Those Awkward Embarrassing Frustrating Moments Of Everything Falling From Under Your Arms, If You Want To Relax More Comfortably At The Beach, If You Want To Get Noticed Carrying A Unique Fashion Tote Bag, & If You Want A Water-Resistant Waist Bag To Store Your Valuable Items, Then You Will Absolutely, Without A Doubt, Love The Beach Buddy Fashion Tote Bag! Available colors: Sea Blue, Hot Pink and Sunshine Yellow. Please make sure to specify your choice of?color when ordering.